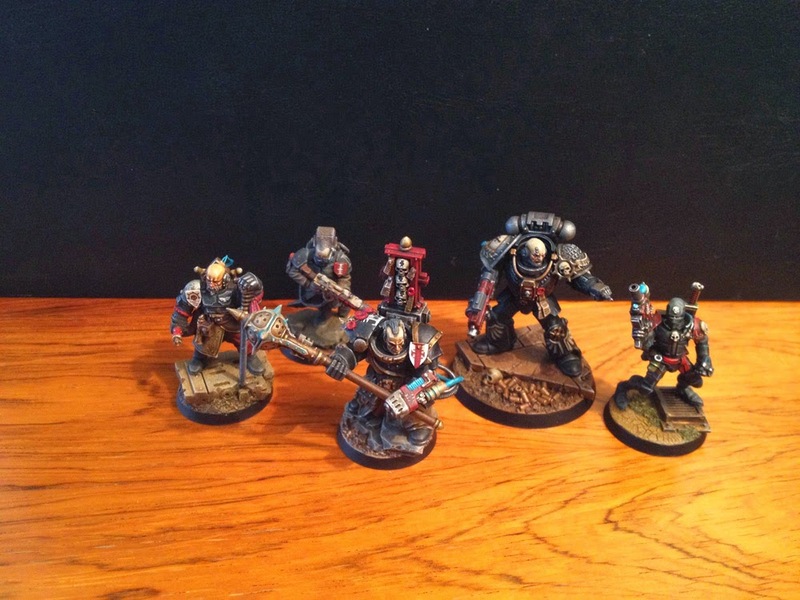 Took some group shots of Ordo Xenos Inquisitor van Kushing and his merry band of men. I stress men as I strongly feel this retuine needs a feminine touch. Not sure what to add though - perhaps the sister repentia I made a while ago, perhaps an eldar advisor or a female mystic of some sorts - I'm open to suggestions! 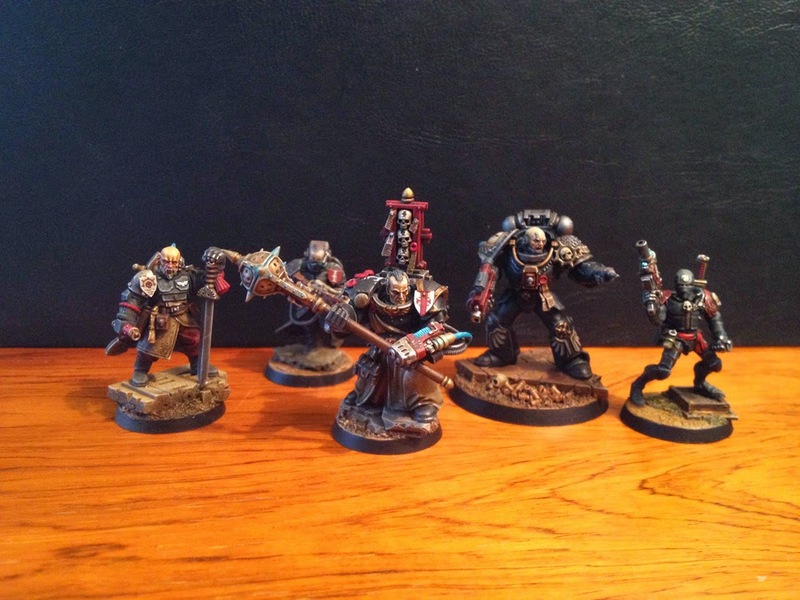 From left to right: Executioner Maunsell, Private Lister, Ordo Xenos Inquisitor van Kushing, Battle-brother Sirius and Operative XIII. I think the Eldar wouldn't fit - the existing models give quite a Traditionalist feel rather than a Radical one. Kushing seems to be a no nonsense, militaristic kind of chap who looks for relatively clean cut, professional looking types. It feels like they need a stern, no nonsense female character. Repentia is loyal enough, but I think her fervour will sit a little uncomfortably with the staid, reserved feel of the rest of the group. My initial thoughts would either be a female gunslinger - where her gender is effectively superfluous to her role - Kushing looking for skills, not caring about gender... Or, someone upright and civilised - a woman of noble birth, all high collars and ruffled clothes - a Seneschal who resolves many of the day to day practical problems for the group while remaining a deadly and often under estimated swords woman. It's amazing how I end up assigning character to your conversions - the way you've put them together leaves me feeling I know how they would think and behave - that they're real people! Thanks mate! That's brilliant input. Oh, and I do think if you want to emphasise the pragmatism over Puritanism, a "reliable" xenos is the way to go. Go totally radical and make up a female Squat Enginseer. That would look sweet. A squat wouldn't be very radical would it? They're more or less part of the imperium. Beautiful work there. Full of atmosphere. For me, I think the Sisters Hospitaler would be a perfect fit for this warband. She has a pragmatic and no-nonsense feel to her.